There is no definite test that diagnoses sepsis, but certain tests can help a doctor make the diagnosis. To learn about some common tests, see Testing for Sepsis. Antibiotics (usually more than one type) are prescribed by the physician based on the type of infection that is causing the illness. The first antibiotics are usually broad-spectrum, which means the antibiotic is effective against several of the more common bacteria. The antibiotics are given by intravenous in order to ensure they get into the blood system quickly and efficiently. Antibiotics alone won’t treat sepsis; fluids are also needed. The body needs extra fluids to help keep the blood pressure from dropping dangerously low, throwing the patient into shock. Giving the fluids by IV allows the health care staff to track how much fluid is being administered and to control the type of fluid the patient is getting. Ensuring the body has enough fluids helps the organs do their work and may reduce damage from sepsis. 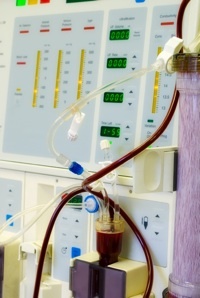 While there are several types of IV fluids, some are standard in treating sepsis. Normal saline is one commonly given fluid. It is a crystalloid fluid. These are fluids that contain minerals, such as sodium, and are water soluble, or dissolve in water. These add fluid to the blood system. Colloids, another type of fluid that is used, are thicker. For example, blood is a colloid. Colloids that may be given by IV include albumin and dextran. Colloids do not dissolve as quickly as crystalloids. More crystalloid fluid is needed than colloid fluid to achieve the same goal of boosting body fluid volume, but crystalloids are less expensive. Since all patients are different and the causes of sepsis are many, not every available treatment is right for each patient. To find out what treatment is being given to you or your loved one and why, speak with your health care provider. Arterial lines – An arterial line may be inserted to help monitor and provide care. Aterial lines are usually only seen in intensive care units. These are not used to give fluids or medications but to obtain bloods samples from the artery, rather than the vein. Intensive care staff can also monitor blood pressure through the arterial line. 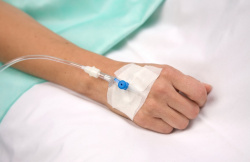 Central venous catheter – Often, it is easier to insert a central venous catheter (central line) into a patient in an intensive care unit because it simplifies giving fluids and antibiotics by IV. Corticosteroids – Although doctors don’t know why corticosteroids work for some patients who have sepsis and not others, they can be helpful. Corticosteroids can help reduce inflammation in the body and depress the immune system, making it less active. Kidney dialysis – also called renal replacement therapy, dialysis may be necessary if the kidneys cannot filter the blood as they should. One of the kidneys’ main role is to filter toxins out of the blood. Mechanical ventilation – Patients who have developed severe sepsis or have gone into septic shock may need help to breathe as they are no longer able to do so on their own. They would be intubated and the tube attached to a ventilator. Oxygen – Patients are generally given oxygen, by mechanical ventilator, mask or nasal cannula, to ensure the body has enough oxygen in its system. PreSep(tm) catheter – this type of catheter was developed to help intensive care unit staff by monitoring the oxygen levels in blood that is returning to the heart. Pulmonary artery catheter – this type of catheter is inserted into the pulmonary artery – the blood vessel that carries blood from the heart to the lungs where the blood can be supplied with oxygen. “Pulmonary” means something is related to the lungs. Vasopressors – Physicians prescribe vasopressors to patients are in shock and whose blood pressures have dropped dangerously low. The vasopressors act by constricting or tightening up the blood vessels, forcing the blood pressure to go up.